The Parish Church of Saints Peter and Paul in Calasiao, Pangasinan (Luzon, northern Philippines) was built by the Dominicans in several stages that spanned the 17th to the 19th centuries. 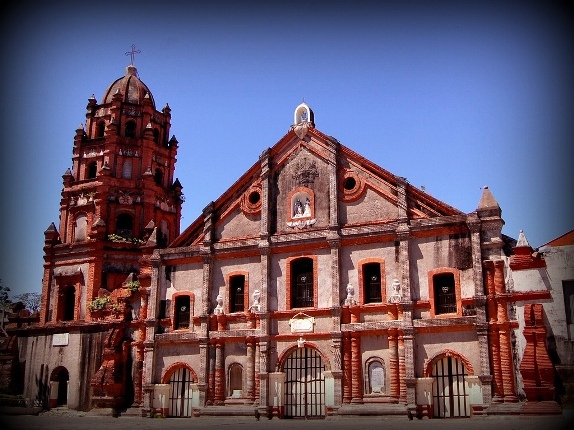 The church is considered as the best-preserved church complex in Pangasinan province. The bell tower and some parts of the church were recently reconstructed, having been damaged by an earthquake. Despite natural calamities the church is well conserved and the recent work has not deviated from its original appearance. The sprawling convento or convent – the site of the 18th century Synod of Calasiao – has an excellent example of a separate kitchen structure. The retablo mayor (major altar) is massive and its complex woodwork may be seen at the back. Hey, Leo, how are you, my friend?!?! I’m from Pangasinan and now that you’ve mentioned the church in Calasiao, may I suggest that you also feature the church in Manaoag, Pangasinan and how the “Miraculous Lady of Manaoag” came about? You’re halfway, my friend. More power to you!!!! !